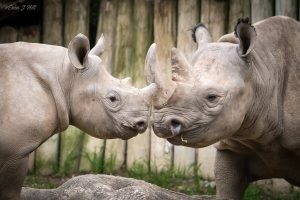 Join us for Bowling for Rhinos, an off site fundraiser by Greater Cincinnati Chapter of American Association of Zookeepers. The Cincinnati Zoo & Botanical Garden has been instrumental to numerous in-situ and ex-situ conservation efforts for the rhinoceros. Bowling For Rhinos is a night of bowling to raise funds and awareness for the plight of all 5 species of rhinos (Javan, Black, White, Sumatran and Indian). Participants will bowl for 2 hours and have the opportunity to participate in several other “supplemental” fundraisers including a silent auction, raffle, and more! You can also support the cause by participating in our silent auction or raffle, or feel free to come and just enjoy the night with friends. Bowling spots are sold out, but please come and support rhinos through the silent auction, raffle & more! 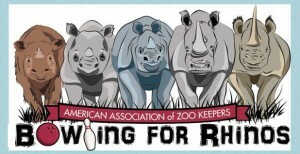 In addition to bowling, we will have t-shirts for sale, a silent auction and a raffle to meet a rhino at the Cincinnati Zoo! Have questions? Contact Jenna Wingate! Would you or your business like to become a sponsor? Please email Jenna Wingate to find out how, or get more info for sponsorships here. Single Bowler: $30 per person Includes registration for one bowler. Couple Bowling Package: $50 per couple Includes registration for 2 bowlers. Whole Lane Bowling Package: $120 for an entire lane Includes registration for up to 6 bowlers and reserves your own lane!